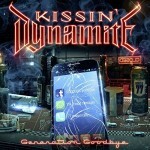 Share the post "Album review: – KISSIN’ DYNAMITE – Generation Goodbye"
German modern hard rock band Kissin’ Dynamite are back with their fifth studio album “Generation Goodbye” and somehow they keep on improving! Previous release “Megalomania”, from September 2014, was a wonderful slice of modern melodic metal. The boys from Swabia have self-produced “Generation Goodbye” and have also become self-managed to give themselves the freedom they need. The line-up remains constant with brothers Hannes and Ande Braun leading from the front on vocals and guitars respectively. Jim Müller (guitars), Steffan Haile (bass) and Andreas Schnitzer (drums) complete the line-up. Title track Generation Goodbye opens proceedings with a Def Leppard feel due to the drums and backing vocals but it superior to anything the Sheffield boys have released in years. Hashtag Your Life celebrates the “joys” of the social media age…catchy little number. If Clocks Were Running Backwards is the best power ballad I’ve heard in a long time and cannot be faulted. Someone To Hate reminds me of Uriah Heep for some reason…probably the style of backing vocals…you just can’t help singing along to these tunes…and so it continues through to the end…classy melodic hard rock and superb power ballads. Final track Utopia starts acoustically and builds ominously…excellent way to sign off…reminds me of one of Ten’s big ballads…only improved. Generation Goodbye is well played, well produced with well written, extremely catchy (but a little quirky) tunes. This entry was posted in ALBUM REVIEWS, ALBUM REVIEWS (Mobile), All Posts and tagged AFM, album, Ande Braun, Andreas Schnitzer, Generation Goodbye, German Modern Rock, Hannes Braun, Jim Müller, Kissin’ Dynamite, review, Steffan Haile. Bookmark the permalink.